Sofia is the capital of Bulgaria and the biggest city in the country. With a population of around 2 million people it can get really crowdy in rush-hours. If you are planning to visit Sofia take your time to read the lines below, because they can save you a lot of brain pain and money later on during your stay. 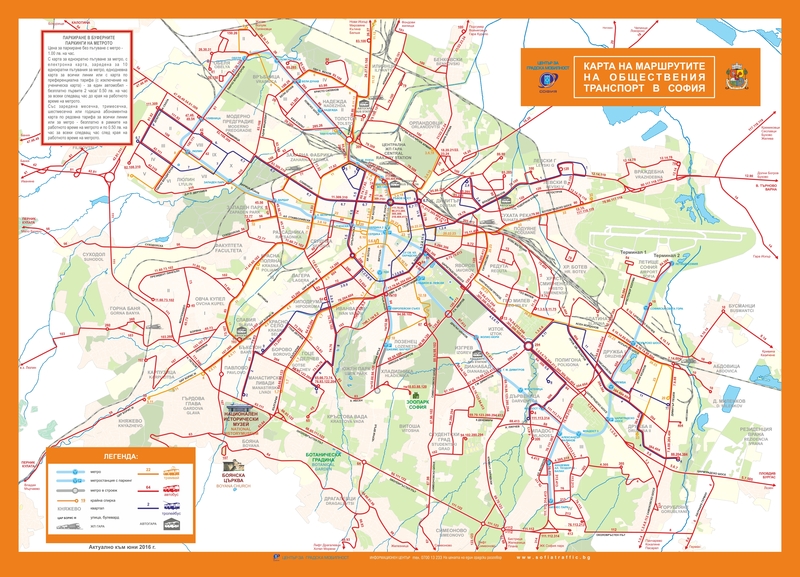 The underground/metro/tube connects all major hot points in Sofia and therefore getting around only using the tube shall be perfect for the average tourist or businessman. – Business Park Sofia – Take the red line to “Mladost 1” station. When you arrive there go on the other side to catch the train going in the other direction. Watch out for the sing “Business Park” written on the train otherwise you will go back to the airport again. – Central Railway – and Bus station – Take the red line in direction city center and get off on “Serdika Station”. Do not leave the underground. Look for the signs pointing out “Line 2” (the blue line). Pash through the tunnel and follow the crowd. It will bring you to the other metro line going to “Obelya”. When you hear “Central Railway Station” you have to get off. The Railway and the Bus Station are next to each other. You can’t missed it. You can buy a ticket from a ticket machine which is located in the tube station itself or from a desk-cashier. – The current price for a single ticket is 1.60 leva (app. 0,80 Eurocent). – If you intend to travel more than once during your stay probably the best choice will be to buy a travel card with 10 single rides for 12,00 lv. (6 Euro). In this way you will save 4 leva (2 Euro) in comparison to the single ticket price. Keep in mind that you will have to pay 1 lev (0,50 Eurocent) extra for the card itself and it is valid for 3 years. – You can buy a bunch of 20, 30, 40 or 50 travell cards but you will not pay less than 1,20 (0.60 Eurocent) leva per ticket. If you don’t like to use the metro/underground/tube in Sofia, you can take bus number 84 from Sofia Airport Terminal 1 and Terminal 2. The bus station is right in front of the airport. Bus tickets you can buy from the driver but you will have to give him exactly 1.60 leva (0,80 Eurocents) or more (if you don’t have change give him 2 leva (1 Euro)). This bus will drive you straight to “Orlov Most” which is the outer side of the city center in Sofia. From there you have many options – underground, metro, trams, and other buses. Unfortunately, the map is not user friendly. If you have a question how to get from point to point, just let me know. – Catch bus number 84 in direction city center. You have to count with 30 mins bus drive and around 20 bus stops until you get to Busstation “Orlov Most”. This busstation is situated on the outer side of the city center and from there you can take the metro/underground for 1 station to get to the hearth of Sofia. Click Here to open the map of the location. Once you arrive at “Orlov Most” continue by foot to Metro Station “Sofia University Saint Kiril and Methodii”. Once you get there you are in safe hands. If you land on the Central Railway or Bus station, then head your self toward the metro/underground station (look for the blue M sign when you are outside the station). – OK Taxi – https://www.oktaxi.net/services_en.php – Official price on their website is 0.79 leva (0.40 Eurocent) pro kilometer with initial charge of 0,70 Leva (0,35 Eurocent); A regular ride from the Airport to the city center is a distance of about 10 km and shall cost you 0,70+0,79*10= 8,60 Leva (4,30 Euro).